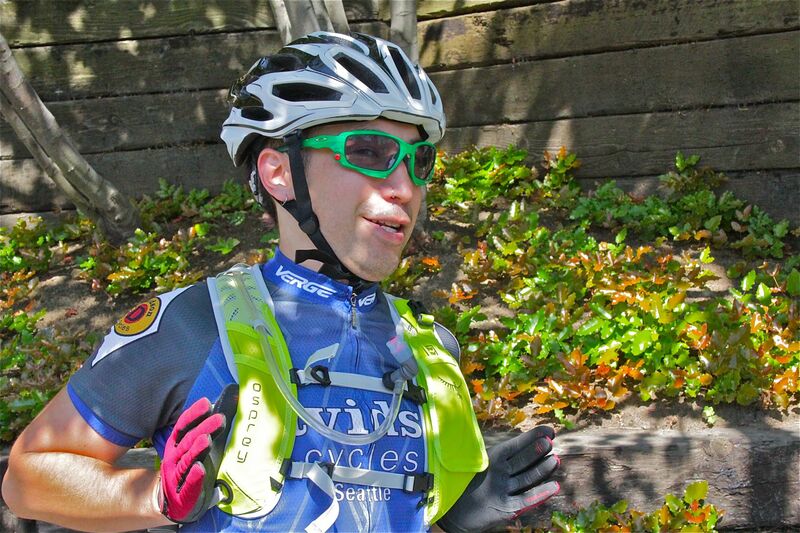 Last month I entered the High Cascades 100 mile mountainbike race, in Bend OR. 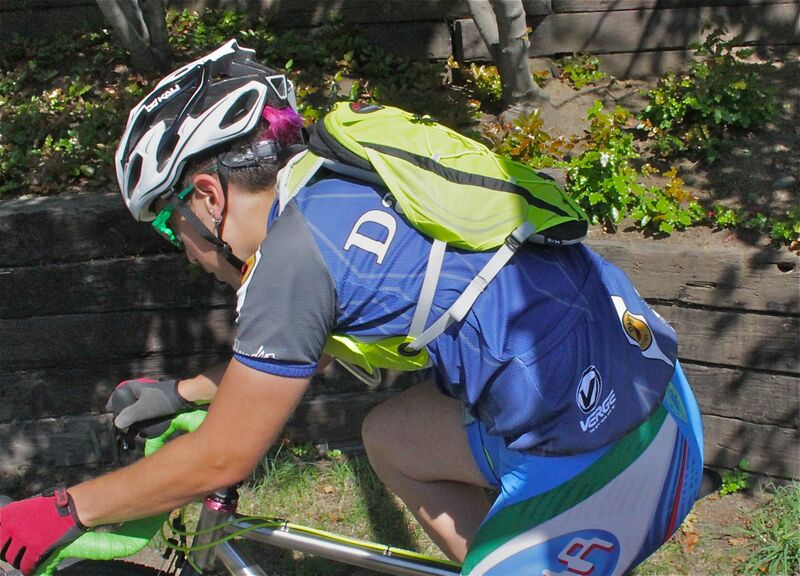 I don’t frequently race more than two hours, and as my participation in the Gran Fondo Leavenworth so thoroughly demonstrated, I am prone to bad cramping in such long, hot competitions. It’s not really the heat so much as I just don’t think about drinking as soon and as often as I should. If I had suffered heinously in the gran fondo, I would be doubly vulnerable in the actual mountainbike race, due to the longer duration, the more intense climbing, the technical nature of singletrack, and the simple fact that my Giant XTC only has one water bottle cage. Even if I chose the high capacity Zefal Magum bottle (1ltr/33oz), that might not be enough to get me to the next aid station. It was clear in my mind that I would need some sort of hydration pack. And there’s the rub: I don’t really like hydration packs. Sure, you can get a pack that holds several liters of fluids, but who wants to carry all that weight for twelve-plus-hours of hard riding? 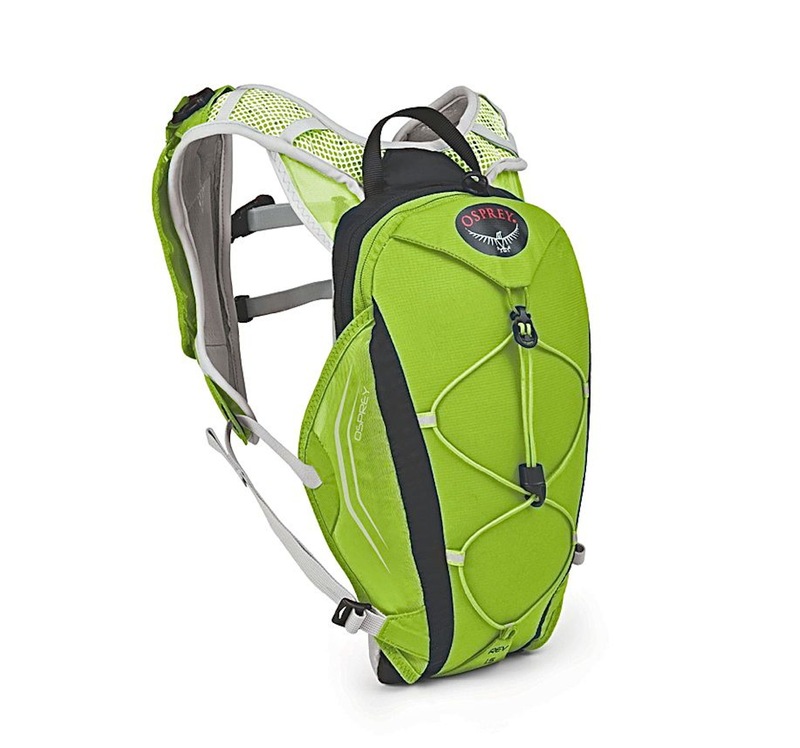 To make matters worse, most hydration packs for cycling seem to be heavily biased towards some sort of off-road touring or adventure riding; the packs are rather overbuilt with too many pockets and other features. What I would want is a very minimal pack for racing. It wouldn’t need truly enormous water capacity because there would be five or sixth aid stations on the course, but the reservoir should be easy to refill. And it would have to fit on me securely, so as not to hinder my freedom of movement on technical sections. I looked about for the right pack, but it wasn’t until I was surfing the Osprey webpage that I found something that met my requirements for mountainbike racing, even though it’s marketed towards trail runners. The slim Rev1.5 pack (size S/M) weighs about a pound with the included hydration bladder and holds just 1 liter of water. The shoulder straps have some convenient but small mesh pockets that can fit gel sachets/flasks or energy bars, but the only other storage is a small zippered pocket atop the bladder compartment. Thin straps and elastic, mesh “webbing” hold the pack tight to your body along the sides of your chest, while two elasticized straps stretch across your chest. Once adjusted, the weight of the pack and water sits high, level with your shoulder blades. It moves with your body yet stays in place, and in hot conditions it doesn’t feel like it’s trapping heat and sweat all across your back. Osprey really puts a lot of thought into their hydration system. The reservoir/bladder has a quick release coupling on the hose so you can gank out the reservoir to refill, while leaving the hose separate and still in positioned on the pack. And the coupling is valved so the bladder won’t leak while detached. A wide mouth, screw-on cap allows easy and quick refills; ice cubes can readily pass through the mouth of the reservoir too. The 90-deg bite valve incorporates a high-power magnet to keep the hose positioned on buckle to one of the chest straps when you’re not drinking. 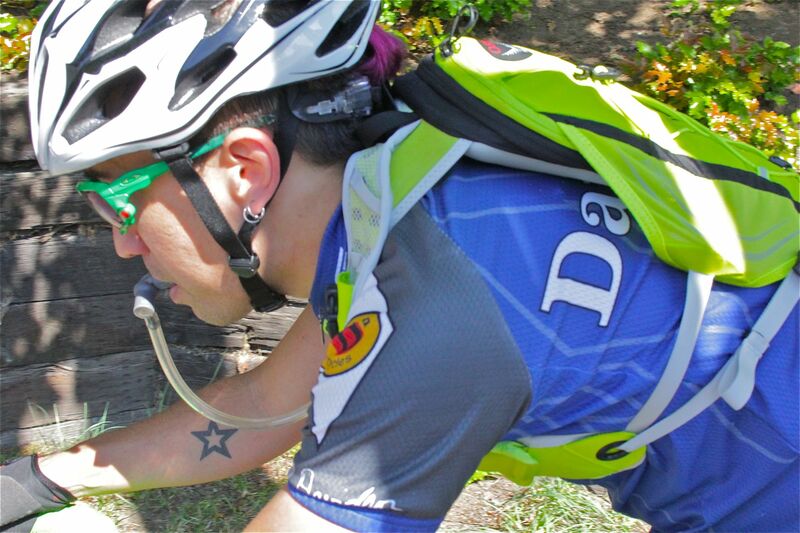 While riding, you can conveniently rehydrate even in the middle of singletrack riding. One other feature is a removable, drop-down DigiFlip™ media pocket that “provides secure storage and quck access to all manner of touch screen mobile devices”. In practice, the DigiFlip did not give useful access to my iPhone while riding, partly because it holds the screen too close to your chest, so your eyes not on the trail ahead. And I couldn’t reliably re-secure the DigiFlip’s snap buckle with gloved fingers while riding one-handed. Still, with the DigiFlip holding the mobile on the left chest strap, access was certainly better than if the mobile was in a jersey pocket. During the race, the Rev1.5 proved to be a competent choice. My strategy was to add Nuun tablets to the hydration pack (or fill it with sports drink) and keep plain water in the Zefal bottle so that I had the option of pouring water from the bottle to cool off, clean my sunglasses, etc. 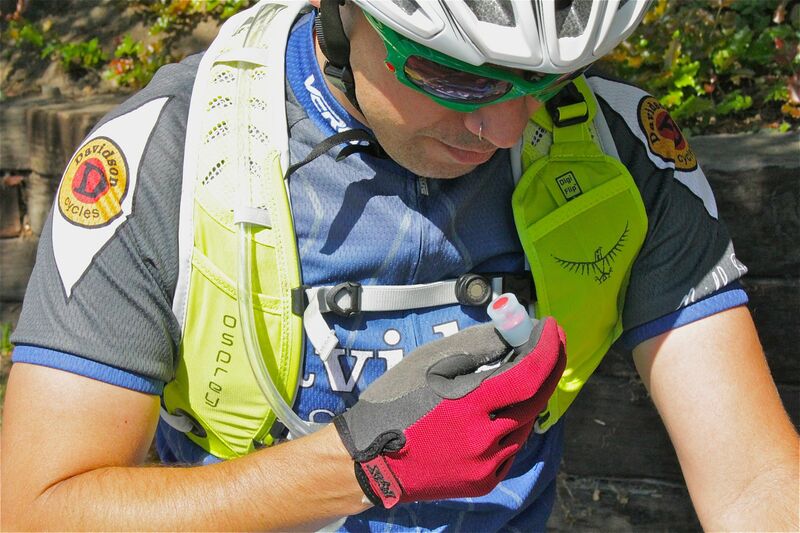 The accessibility of fluids made staying hydrated, even during difficult climbs or singletrack. This was literally the first mountainbike race I had entered in 15 years, and I’m not gonna pretend that my singletrack skills are so good that I can negotiate rocky descents with one hand on the bar and another holding a water bottle. Having the hydration pack simply gave more opportunities to drink. Being able to pull the whole reservoir out of the bag was a nice option, since it’s easier that way to fill it completely while also avoiding drenching the pack itself unnecessarily. And even after nearly 13 hours of riding, the Rev1.5 never felt burdensome, nor hot on my back. That magnetic retention for the bite valve is simply genius. I had the S/M size Rev1.5. The M/L size has the same reservoir, but the straps and support structure are made to fit bigger riders. For my physical stature, the S/M was the obvious choice. It’s still small enough that my jersey’s back pockets could be accessed. I only fully drained my reservoir once, in the brutal 4,000’ of climbing between the aid stations at Mile 50 and Mile 70. Finally, the “flash green” colourway matches the current Bike Hugger kit well, but after all the dust from the race, it looked right dingy. Surprisingly, it machine-washed well, and in fact all of the photos of me wearing the Rev1.5 are after I cleaned it. The $70 Rev1.5 performed well in my 100 mile mtb race, but if I had been riding in some sort adventure that did not have aid stations every 15-25 miles, I would have needed a pack with more fluid capacity. And if it had been a gravel grinder without real singletrack riding rather than an mtb race, I probably would have preferred to not wear a pack on my back at all. Of course, my CX/gravel bikes have room for a second bottle cage, so I would probably not need to augment water capacity with a pack anyways. Still, if “Rebecca’s Private Idaho” 100mile gravel grinder is especially hot later this month, I might use the Rev1.5 because it makes drinking so convenient that I’m more likely to stay hydrated on such a long event.